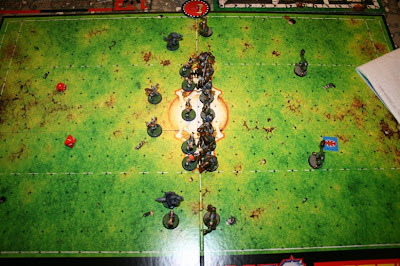 While the Titans and Buccaneers duked it out, the main field of the Antares Multiplex hosted the Ragnarock Ravens' season opener against Braga's Brutes. The much-anticipated Turboleague debut of the Ravens drew 11,000 screaming Norse fans and thousands of orcs to the stands and a surprise one-match endorsement deal from Bloodweiser for the home team. 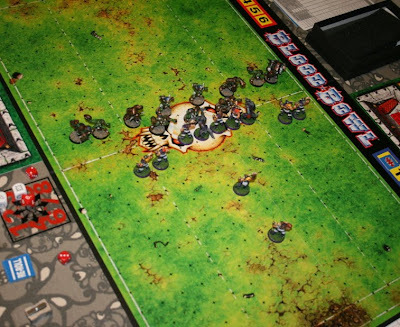 That Bloodweiser might well come in handy, because the visiting Brutes came to the Antares Multiplex with a 2-0-0 record and league leads in both touchdowns allowed and fatalities, having previously defeated both of the other Autobowl contenders. As the snow was cleared from the astrogranite, the Ravens won the coin toss and chose to receive in the first half. 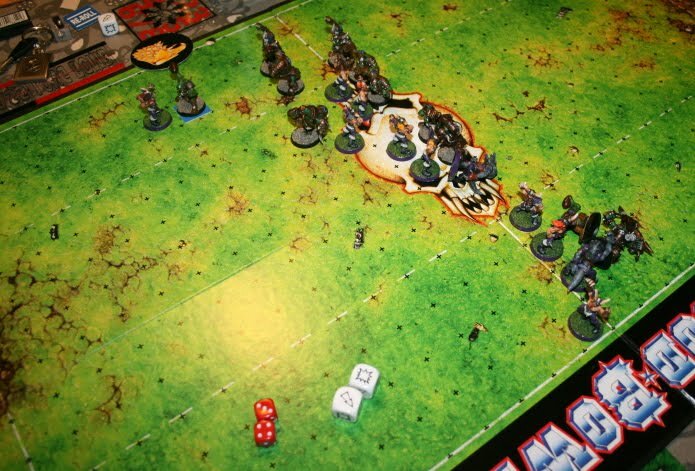 After Ravens head coach Asatru Sjöfarare's tall tales about receiving wolf cubs from supernatural parties unknown (presumably some odd Norse permutation of Khorne), a lively anticipation surrounded their Blood Bowl debut. True to form, werewolf Freki leapt off the line at the kickoff and drove into Brutes lineman Galhag. 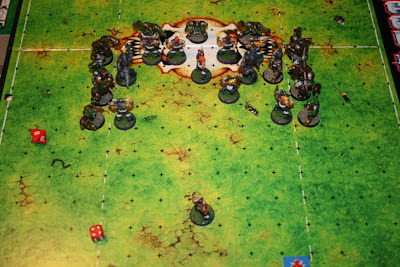 Brutes player-coach Braga da 'Ed Bash'a, however, was wily enough to have anticipated the frenzied Norse, and Freki blundered into a line of waiting orcs who gave him a hearty Blood Bowl welcome. As werewolf met astrogranite, the Brutes took the initiative and stormed onto the Ravens' side of the field. Ravens thrower Thor Åkenskaldi failed to pick up the ball, and Brutes thrower Slib'ry Ands grabbed it and ran into the end zone for the first touchdown! The chastized Ravens set up for their next reception, minus one knocked-out lineman. 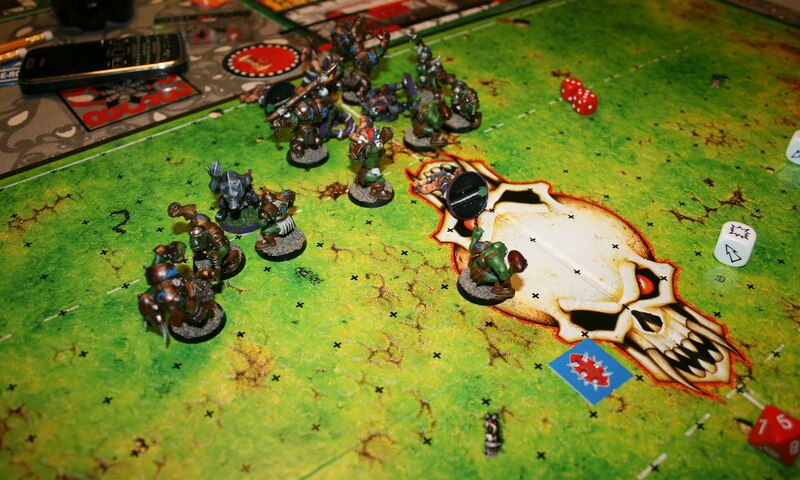 Seeing the weakness in the Ravens' dispositions, Braga called on the powers of Waaagh! His team exploded off the line in a devastating blitz, wrapping up the Ravens offensive line and sending the cornerbacks around the sides to attack the Ravens thrower. With the roaring greenskins bearing down on him, in almost a rerun of the previous drive Thor Åkenskaldi fumbled the ball, allowing Slib'ry Ands to drive in. This time, though, Slib'ry Ands lost his footing and fell, but Åkenskaldi was also tackled before he could get to the ball. In the chaos, the other Brutes thrower Grab da Bol grabbed the ball and doubled the Brutes lead to 2-0. 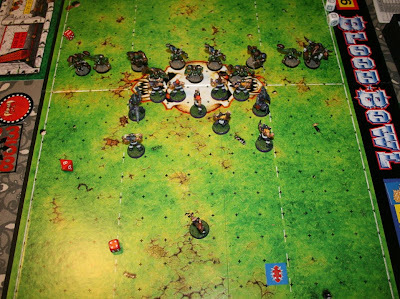 Faced with an 0-2 deficit in the first, Ravens coach Sjöfarare either momentarily lost his wits or decided it was time for a gamble, and set up four players in the left-hand wide zone at the kickoff. The Brutes' dim-witted kicker failed to notice this egregious violation of the rules and launched the ball into the air, only for the referee to dash onto the pitch and blow the play dead. For a moment, total chaos reigned as jeers and rocks rained down on the pitch, Braga throttled his kicker and the officials struggled to separate the teams. When play was finally restarted, coach Sjöfarare over-compensated and deployed no-one in the left wide zone! When the kick-off landed right there, Grab da Bol was able to live up to his name once more, but with time running out, all he could manage was a pass to blitzer Galoth. 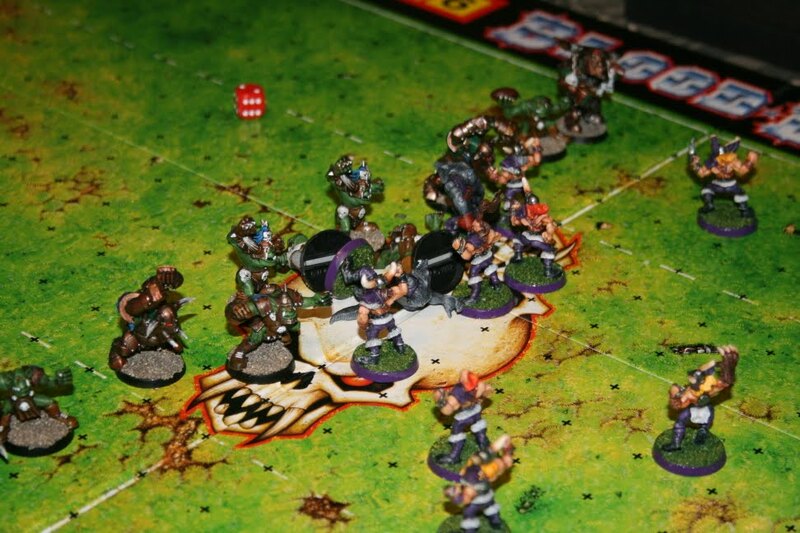 Meanwhile, blitzer Urghuk cheerfully knocked out Ravens lineman Per Yngve Ohlin. After a truly awful halftime rendition of "Slaanesh on the Street" by a Norse skald, the Ravens fans were so dejected the Brutes supporters actually stopped fighting them, and started cheering for the team! 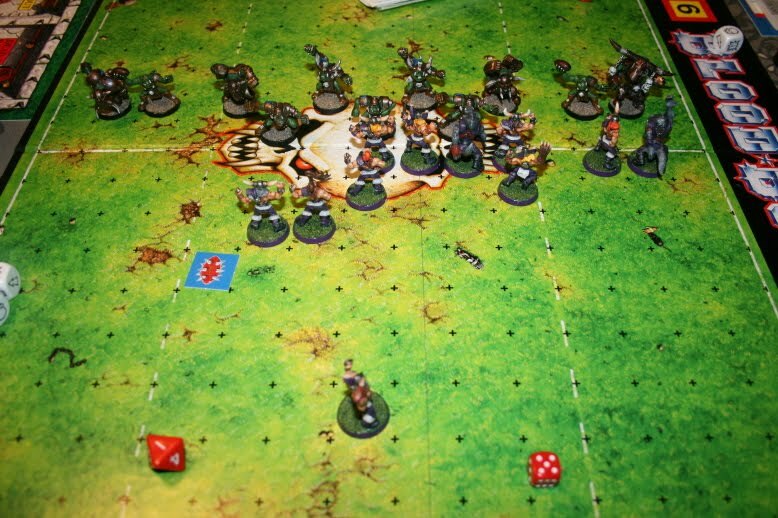 Bolstered by their fans' support, Braga's greenskins set up for their first reception of the game. The Brutes' offensive drive got off to a rollicking start as blitzer Sorgask smashed Ravens werewolf Geri unconscious. The two throwers proved they were aptly named when Grab da Bol picked up the ball and handed it off to Slib'ry Ands, who fumbled the reception. Ravens catcher Leifur Eriksson dashed in and grabbed the loose ball but slipped and fell, knocking himself out cold. Grab da Bol then attempted a pass to Galhag, who failed to make the catch. Eventually the ball was delivered to Sorgask, who sped off down the pitch at a reckless pace, falling over just short of the end zone. 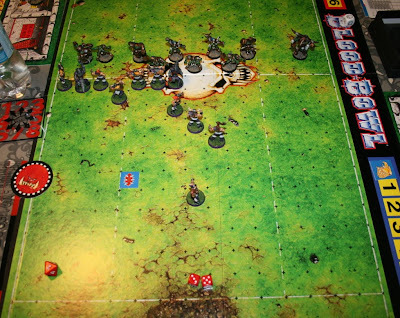 Ravens lineman Reidar Horghagen attempted to dodge away from Braga and get to the ball, but the black orc brought Horghagen down with a ferocious tackle and a blood-curdling roar. Ravens lineman Jan Axel Blomberg, knocked out in the first half and returning to play in the second, was laid out by Galoth. Sorgask picked himself up, retrieved the ball and scored to make it 3-0 Brutes. As the teams set up for the kickoff, the hapless referee wandered too close to the Ravens' fans. Still bitter about the illegal setup call in the first half, they rushed the field and scragged him! Neither side seemed particularly eager to take advantage of his absence, and play went on: the kickoff bounced out of bounds, and the Ravens were awarded a touchback. Black Orc Azgrum pushed Ravens lineman Thomas Haugen into the crowd, where he happily crowdsurfed on the reinvigorated Ravens fans! The Ravens lost control of the ball in the mayhem, and between themselves, the Brutes throwers managed to get the ball under control and handed it off to Sorgask. He charged to the Ravens end zone and scored his second touchdown of the game to make the final score 4-0 Brutes. 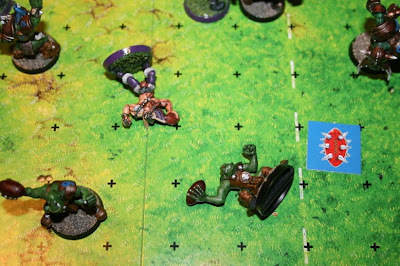 MVP honors went to Brutes blitzer Urghuk for his aesthetically pleasing knockout of Ravens lineman Per Yngve Ohlin, and to Ravens lineman Tomas Haugen for his inspired crowdsurfing, this being considered by far the best thing any of the Ravens players achieved. 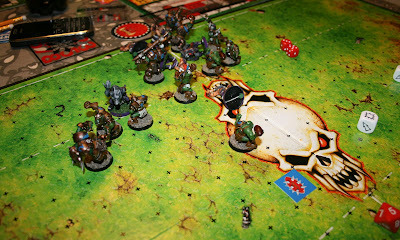 With their decisive victory over the Norse team, Braga's Brutes are the clear winners of the inaugural Antares Autobowl. The Brutes are dominating the Turboleague in the early going with a 3-0-0 record and 7-0 goal differential; they have yet to give up a single touchdown! The Ravens must be considered lucky to escape their brutal introduction to the Turboleague at the hands of the Brutes with no permanent damage to their lineup, both injured players being expected to return in time for their next game. Coach Asatru Sjöfarare: "De vore satans mördare, dom orknar. The domare, the judge you know, he was incompetent, so the people tied him to the midsummers pole. We were not ready for achuun här, och now we will go back to skool. Vikingarna will never surrender, ever!" Player-coach Braga da 'Ed Bash'a: ""Enlightenment comes to those who seek death. 'Tis more beautiful than you can ever dream...HAHAHA! Iz I do dat voice right? 'Ave ye 'erd dat weird pointy 'eerd coach T.Rex?!? Hesha make me laugh every time! HAHAHA! Misha think dat our team did good today but in da end theysha do exzactly what me iz tell 'em, or I iz give their parts for da team shaman doctor. Wesha not come 'ere to speak fancy or talk 'bout feelingz, wesha be 'ere to win shinies 'n when possible, bash everyfing in our way! Mesha like to end dis by saying; 'Tis thine in battle to confer the crown, the victor's prize, the mark of sweet renown...HAHAHAaaaaaa!"" T3. BRU #10 Slib'ry Ands scores a TD! T6. BRU #9 Grab da Bol scores a TD! T8. BRU #6 Urghuk KOs RAR #96 Yngve Ohlin, BRU #10 Slib'ry Ands throws the ball to #8 Galoth...it's a catch! T4. BRU #8 Galoth blocks RAR #91 Jan Axel Blomberg = Badly Hurt, BRU #5 Sorgask scores a TD! T8. BRU #10 Slib'ry Ands hands off to #5 Sorgask (mind you, no more rerolls left at this time) who catches it and scores the final TD!